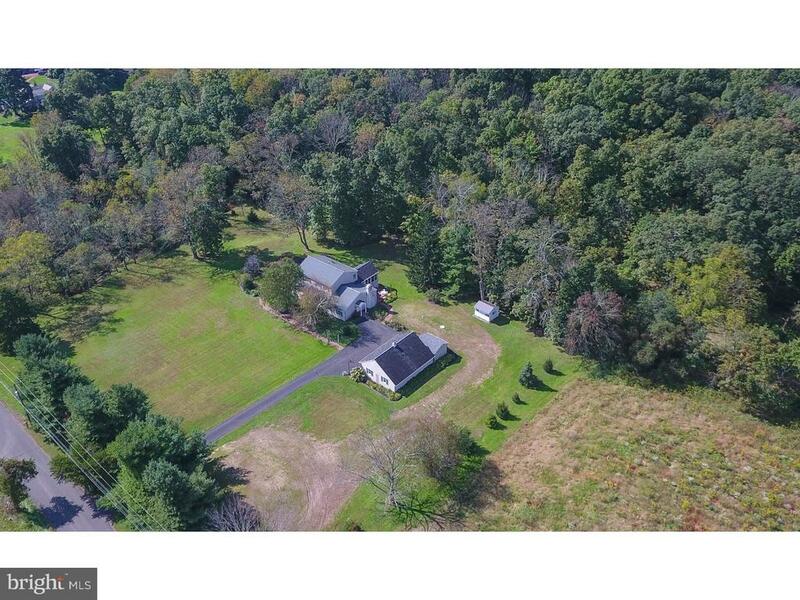 All Bedminster homes currently listed for sale in Bedminster as of 04/21/2019 are shown below. You can change the search criteria at any time by pressing the 'Change Search' button below. If you have any questions or you would like more information about any Bedminster homes for sale or other Bedminster real estate, please contact us and one of our knowledgeable Bedminster REALTORS® would be pleased to assist you. "Exceptional opportunity of this fully rehabbed and stylized classic Bucks County Farmhouse, circa 1829, that anchors the rare 'fly-in' community in our area, Elephant Path. But NOT just a community for pilots ... 4 of the 8 current property owners don't fly. The gated community offers a private park-like setting that is highly desired. Adjunct to the main home is the 3 car garage with hangar. Owners who don't use hangar for plane use for car collections, boats and more! Above the garage/hangar is an additional 1500 sq ft space. Highlights of the home are the random wood floors, stone fireplace, Russo wood/coal stove in the section of the home that was the original smoke house and is now the den/family room, newly renovated high-end chef's kitchen large center island and Sub-Zero, Jenn-Aire range & Fisher-Paykel dishwasher; a newly remodeled master bath ..... the main residence has all the charm associated with Bucks County and all the modern amenities that you need. 2750 feet paved runway, pilot controlled lighting, parallel grass runway, gated entrance (remote control). This enclave of 8 homes (4 of which still have hangars) share the runway than traverses the middle. Each homeowner pays $1500 yearly for runway lighting, insurance and common area landscaping/maintenance." "Behind Iron Gates and Walls of Fieldstone, Elephant Path is a Fly-In Community Surrounded by Picturesque Bucks County Countryside. A Paved Airstrip (2750' x 35', with Pilot Controlled Lights, VASI, and Parallel Grass Runway) Traverses the Center of the 8 Estate Homes that make up this Aero Community. Situated on 10 acres, this Sprawling Ranch Home was Custom Built by Lancaster County Craftsmen using 2 x 6 Construction. The Covered Front Entrance leads into the Tiled Foyer and Open Concept Floor Plan that Begins with a Soaring Gabled Post and Beam Great Room. The Stone Fireplace Stretches from Floor to Ceiling, and is Partially Exposed on the Other Side where it Intermingles with the 18' Soapstone Island in the Chef's Kitchen. Visitors to the Great Room can Pull Up a Seat at the Pass-Through Adjacent to the Fireplace to Converse with the Cook or Even Lend a Helping Hand. Adjacent to the Great Room is a Beautifully Appointed Dining Room with an Abundance of Sunlight, and Around the Corner is a Study with Built-In Cabinets and Bookcases. Oversized Sliding Glass Doors in both the Great Room and Breakfast Area Provide Outside Access to the Fenced In-Ground Pool. The Large Master Suite is Tucked Away on its own and Includes an Adjoining Exercise Room. Here Walls of Windows and a Pair of Sliding Glass Doors Open onto an Azek Deck with Built-In Seating to Enjoy the Treeline Backdrop and Romantic Sunsets. The Attached 2,400+/- sq.ft. Garage/Hangar with 9'8 Main Door Clearance is a Dream Come True for the Aviation or Auto Enthusiast - Room for 7 Cars! The hangar is 55' wide and 39' deep overall with the hangar door 40' wide. The Attic over the Garage/Hangar has been Finished, and Would Make a Great Artist's Studio, a Large Open Span with Exceptional Natural Light from the Skylights. Yearly fee is shared by community to provide runway lighting, insurance, maintenance of common area grass and landscaping. Easy Commuting to ..... ANYWHERE ! Fly-In appointments Accepted - on seco"
"OPEN HOUSE Sunday April 21st from 12noon - 1-pm. A long driveway leads to this tucked away, classic style home with full front porch plus 4 detached garages. Spacious rooms and an open layout with the main living areas featuring hardwood floors. Oversized kitchen with center island bar and endless counter top/prep space provided, highlighted by a custom backsplash with Mercer tile inserts. Stainless steel appliances include a JennAir wall oven and dishwasher. Dining choices are offered at the kitchens center island with double sink or in the adjoining sunroom. A favorite room in the home is the sunroom, with walls of windows, a cathedral ceiling and exposed beams and beautiful hardwood flooring. More formal occasions may be hosted in the dining room, conveniently open to the kitchen and large enough to hold a crowd. The great room has French doors that open to the study, where built-in bookcases surround a wood burning fireplace. A full bathroom and adjoining 26' living room which is a flexible space on the main level and allows the possibility for a first floor master, an in-law or au-pair suite. A spacious laundry room completes this 6+ room first floor. Upstairs the rooms include 4 bedrooms, are all nicely sized with ample closets and a large bathroom. An extra for your convenience is a Central Vacuum System and another extra for exceptional economics is a Pellet Stove in the 2nd basement. The detached 3-car garage plus a separate detached 1-car garage, allow plenty of protected parking and storage. There is even a garden shed to keep everything organized. Located just minutes to both Downtown Doylestown as well as Dublin Borough. Surrounded by views of manicured grounds with perennial gardens and specimen plantings - and complete seclusion enjoying 5 established acres with wooded backdrop - a true place to come home to ! A new Septic System was just installed, end of August." "Twenty four acres in Pipersville. Property sits between address of 6801 and 6837 Old Easton Road. Sign is posted. Uses Permitted by Right: Al General Farming A2 Nursery A6 Noncommercial Kennel A8 Agricultural Retail B1 Detached Dwelling Cl-C10 Residential Accessory Uses D3 Library or Museum D9 Day Care Center Fl Medical Office F2 Veterinary Office F3 Office G4 Service Business (excluding laundry and dry cleaning services) G7 Eating Place G10 Repair Shop G20 Guest House G28 Dwelling in Combinations J3 Temporary Structure J9 Accessory Playgrounds and Recreational Areas"